Make it 4 for 6. Jurgen Klinsmann’s squad has put up a goose egg in all but 2 of his matches as manager. Against France, the Americans never looked capable of producing meaningful scoring chances, though they did defend with gusto. While both managers used a base 4-4-2, neither formation resembled a carbon-copy 4-4-2. 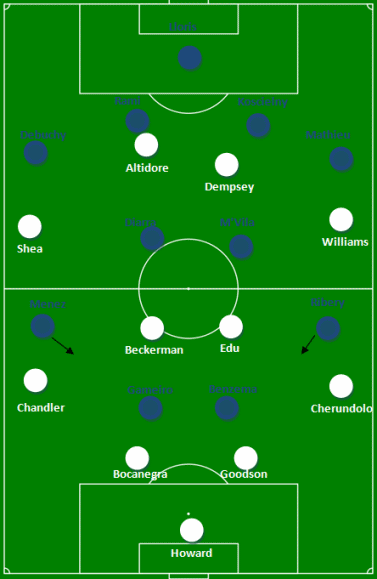 All four forwards took it in turns to come into the midfield, with Clint Dempsey – as predicted – playing a particularly expansive role; both pairs of fullbacks looked to get forward (France’s duo had more success); and each squad used two holding midfielders. As the game wore on, France’s quality began to show. Their central midfield pair of Alou Diarra and Yanni M’Vila really got the better of Maurice Edu and Kyle Beckerman. The former completed 89% of their passes while the latter completed just 81%, an even more lopsided stat considering M’Vila and Diarra also attempted 26 more passes. And they weren’t just better controlling the run of play. They made 11 more interceptions as well (13 to 2). Their solid performance allowed Ribery and Menez to liberally link with forwards Kevin Gameiro and Karim Benzema. Tactically, the main difference between the two squads occurred along the flanks. Menez and Ribery were much more liable to move inside than Brek Shea and Danny Williams. Ribery in particular pinched-in with regularity. Of course, since he was playing as an inverted winger, this was only natural. And it was Ribery’s inward surges that helped create a number of early chances for Les Bleus. US center backs Clarence Goodson and Carlos Bocanegra provided able cover and helped Tim Howard sniff out most of France’s scoring opportunities. The Americans, however, could have done a better job defending on the flanks. Too often Bocanegra and Goodson were called on to make last ditch tackles and clearances, which can be seen in the clearances chalkboards of the two teams. France consistently broke up US possession along the wing while the Americans often had to clear the ball from inside the box. Ironically, it was a simple chip down the middle that led to the lone goal. Following a Tim Howard goal kick, Marvin Martin popped a pass over the head of Goodson, and Loic Remy outmaneuvered the center back before beating Howard. The mistake was a blemish on Goodson’s otherwise fine performance. But it will likely be enough to consign him to the bench if Oguchi Onyewu is healthy on Tuesday. It’s no secret that the USA isn’t exactly spoiled for choice when it comes to strikers. But even the best forwards rarely find the net all by themselves. 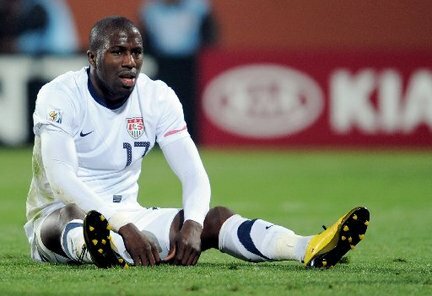 And Jozy Altidore and Clint Dempsey were given very little to work with against France. The gringos did find some joy on the left flank. In fact, all of their key passes originated from that wing – save one chance off a corner – but meaningful scoring opportunities were few and far between. In our preview, we noted that this squad lacks natural creators. It showed today. On Tuesday, Klinsmann may turn to Michael Bradley to provide some much needed vision. Bradley does know a thing or two about finding the net against Slovenia. Gringos, were you frustrated by the lack of scoring opportunities? Or was this a decent showing with Donovan, Holden, and Torres absent? I don’t think Danny Williams is any kind of answer at right mid – but Brek was almost as bad on the left. No wing play and getting bossed in mid-field left Dempsey and Altidore somewhat stranded amidst an ocean of blue defenders. I commend Klinsmann for pushing the “possession out of the back” approach, but I am seriously doubting that we have the quality to implement it. Our transition play is too slow and our defenders and holding mids simply give up too much possession to any team the applies high pressure. I want to believe that losing to top competition will pay off come qualifying, but not playing to our strengths is an awful risk to take. Neither winger did much. But I do think playing out of the back is the right choice, at least most of the time. However, it will only work if Bradley, Holden, and Torres are playing, or at least a pair of them. Edu and Jones are decent passers out of the destroyer role, and Edu has actually played further up the pitch in the Champions League. But neither will excel playing alongside Beckerman.